The Amano EX-3500N has been engineered for value and simplicity. This clock is an affordable electronic time recorder designed specifically for small businesses. 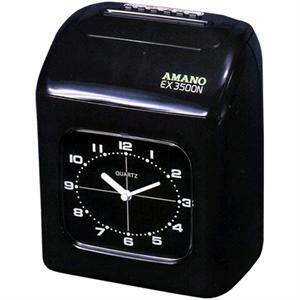 The EX3500 series time clock will provide years of reliable time keeping after its quick and easy setup. Six column time card format with automatic card feed. Two-color printing capabilities for irregular and progammable time registrations. Accommodates weekly, bi-weekly, semi-monthly and monthly payroll. Large, easy to read analog clock dial. Dimensions: 8.75" x 7.5" x 5"